I'm embarrassed to admit it, but I'm a bit of a supply junkie. In theory, I like that all you need for polymer clay is your fingers. But in reality, I'm always tempted by the newest gadget, tool, or supply. I'll find some excuse to justify getting it — but then, more often than I like to admit, that thing will sit for months or even years unused in my craft closet. I feel guilty about it. But it doesn't stop me from doing it again the next time a really interesting-sounding product comes out. I suspect it's a pretty common situation for crafters. I've known scrapbookers with stacks and stacks of patterned papers (none of which they wanted to actually use) and rubber stampers with literally thousands of stamps. As long as you're actually using those things, it's really not a problem. But collecting supplies you never use can weigh you down — and you don't want anything weighing down your creativity! 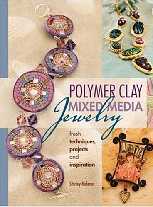 Shirley Rufener's Polymer Clay Mixed Media Jewelry is just the book for supply junkies. This book's projects incorporate some of those supplies you might have bought but never gotten around to using: things like chalks, alcohol inks, metal leaf, embossing powders, custom stamp-making kits, precious metal clay, resin, and more. There are a couple of things that really set this book apart. First, it has an excellent introduction. At 22 pages, it's longer than normal, but it includes instructions for using polymer clay and precious metal clay, plus the basics of jewelry assembly. I especially liked the examples of matching end cap and closures made from polymer clay. I also found the introduction to precious metal clay helpful (that's one of those supplies I've had in my closet and have been afraid to use). Rufener has instructions for working with it and firing it, plus step-by-step instructions for making your own metal clay bails. She also has a nice picture showing the different effects you can achieve using liver of sulfur patina. The other thing that sets this book apart is its wide variety of projects and styles. Rufener says in the intro that she included a variety of jewelry styles "in the hope that something will catch the eye of a very diverse group of readers, crafters, and artists." That's a nice goal for an author to have, and I think she succeeded. While there were some projects that didn't appeal to me at all (but presumably appeal to someone out there with different tastes), I did find several projects I really liked. She encourages readers to make the projects their own — use favorite colors and experiment with embellishments. "Allow yourself to unleash the creativity inside." While I like many of the projects, the project instructions are just so-so. I found a lot of problems — things like typos, errors, pictures out of order, and confusing instructions. For example, there were a couple of places where I was almost sure she was telling me to sand an unbaked clay piece. Most of the unclear stuff can be figured out with a couple of re-reads, especially for folks who are familiar with polymer clay. But I think the book really would have benefited from a more thorough editing job. And while supply junkies may enjoy finding projects they can use their stockpiles on, others may be a little overwhelmed at the long supply lists. I have a pretty well-stocked craft room, and there were quite a few of the supplies that even I don't have. In some cases, it seemed to go a little overboard — for example, requiring a white pencil to sketch a pattern to carve into the clay. While more experienced clayers may know of other supplies that would work just as well, I worry that beginners may feel the need to buy supplies that aren't really necessary. And that's another thing. Rufener says the book is aimed at beginners and intermediate crafters (though she hopes accomplished artists will find mixed media applications and techniques too). Even with its extensive introductory info, I'm not sure this book would be good for beginners. The supply lists are awfully long, and the projects are all fairly complex. Combine that with the confusion some of the poorly-edited parts caused me, and I'm just not sure beginners will find success with these projects. But I do think intermediate — and probably advanced — clayers will find something useful here. There are some really unique ideas included in the projects. She also includes various helpful tips for working with clay... some that I've figured out over the years, but others that were new to me. "Everyone is creative — you just have to take the time to find your niche. Part of that includes giving something a shot that you haven't tried before. More importantly, allow yourself time to get the hang of it. Don't expect perfection on your first or even second or third attempt... It's a learned art." The other projects I tried went better. 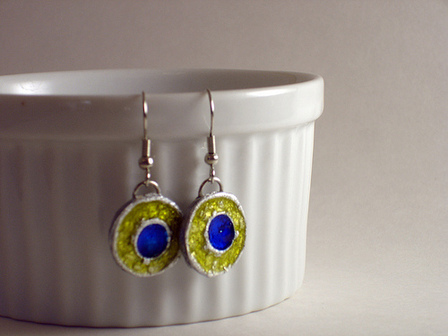 I used the instructions for the Sicilian Spice Bracelet, making earrings instead. I also made the Chalk Pod Floral Pendant, and was very happy with the way it turned out (still deciding if I'll make it into a pin or a necklace, though). Covers a nice variety of mixed media using a wide variety of projects and styles. Long intro section covers polymer clay, precious metal clay and jewelry techniques. Poor editing causes some parts to be confusing. Extensive supply lists may make for pricey projects. Great review - I agree with just about all of it, and I love your earrings! Awesome review! I agree very much that this is not a book for beginners. I finally purchased a copy and enjoy the variety. Somewhere in it is a teeeeny picture of my what they call a clever clasp, lol. Hi there! Just came across this blog and I love it! I've just spend about an hour going through your archives. As a polymer clay person, I'm quite impressed! Keep it up! 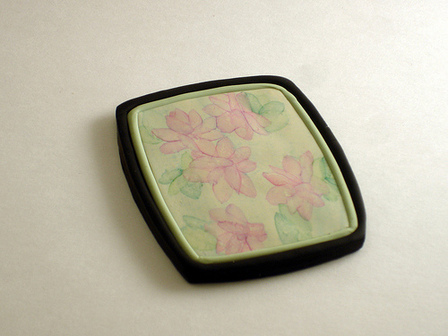 Go ahead and check out my blog to see some of my polymer clay creations if you want. Oh thank you for the honest review! I was curious about this book. Thanks all -- I'm so glad the review was helpful. And you're being much too modest, Tina. I found your clasps on page 30, along with a photo that I certainly wouldn't call tiny. Good work!